Going for an interview is a very important step towards getting a job. But it can be a stressful experience. So how do you put your best foot forward when you are inexperienced and nervous? 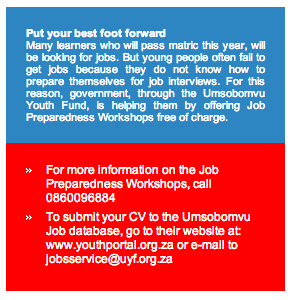 There is help in the form of Job Preparedness Workshops offered by the Umsobomvu Youth Fund. Attending a workshop can boost your chances of getting that dream job. The workshops are held in all nine provinces. having a professional image, including dressing and acting professionally. 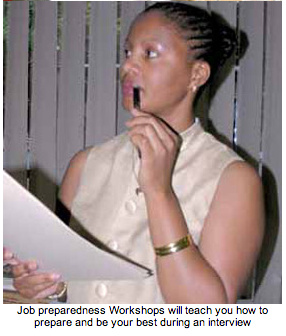 The Job Preparedness Workshops are not only open to learners who have passed their matric. Other unemployed people, including unemployed graduates, may also apply. If you are a male, you have to be between 18 and 35 years old. Women of all ages may apply. Looking for a job can be expensive because you have to pay for postage stamps and for photocopying of certificates and CVs. To help you keep the costs of job hunting down, you can submit your CV through the Internet on the Umsobomvu youth job database. Through the database you will be connected to job opportunities in the public and private sectors. This will help you get in touch with people who might offer you a job, or with learnerships or internship programmes. 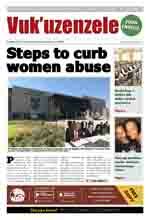 Disabled people in rural areas still face many problems. These include difficulty in getting skills and jobs. In addition, public transport systems in rural areas do not have facilities for disabled people. For many of them, taxis are the only available form of public transport. The summit therefore called for suggestions to make taxis more accessible.